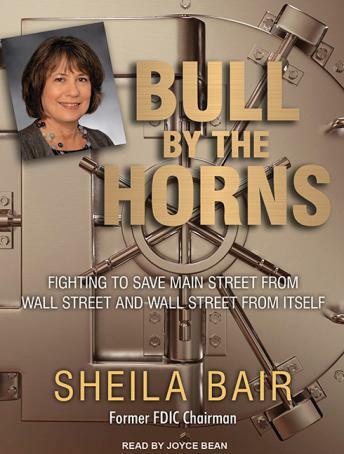 Sheila Bair is widely acknowledged in government circles and the media as one of the first people to identify and accurately assess the subprime crisis. Appointed by George W. Bush as the chairman of the Federal Deposit Insurance Corporation (FDIC) in 2006, she witnessed the origins of the financial crisis and in 2008 became-along with Hank Paulson, Ben Bernanke, and Timothy Geithner-one of the key players invested in repairing the damage to our economy. Bull by the Horns is her remarkable and refreshingly honest account of that contentious time and the struggle for reform that followed and continues to this day. A level-headed, pragmatic figure with a clear focus on serving the public good, Bair was often one of the few women in the room during heated discussions about the economy. Despite her years of experience and her determination to rein in the private banks and Wall Street, she frequently found herself at odds with Geithner. She is withering in her assessment of some of Wall Street's finest, and her narrative of Citibank's attempted takeover of Wachovia is a stinging indictment of how regulators and the banks worked against the public interest at times to serve their own needs.